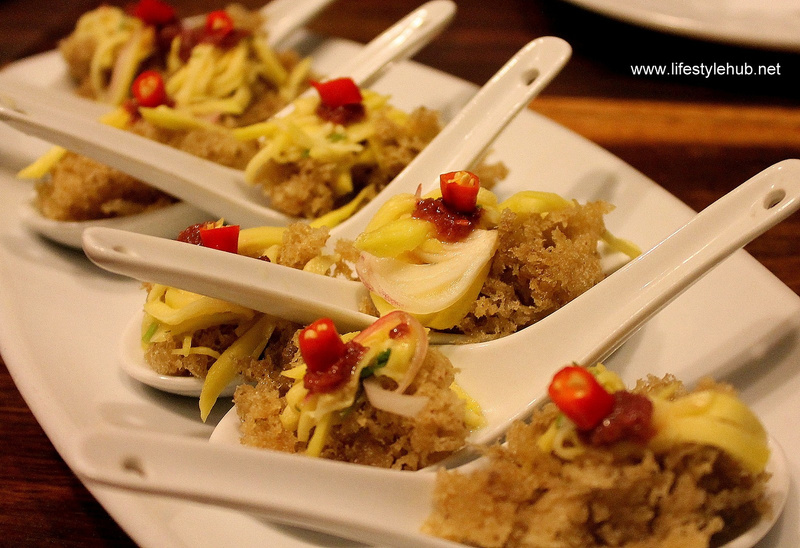 One of the Philippines' culinary capitals still has enough space for more food. A concoction of the best dishes from all over the country comes to Pampanga as Mesa Filipino Moderne opens in SM City Clark. Vegetarians rejoice! 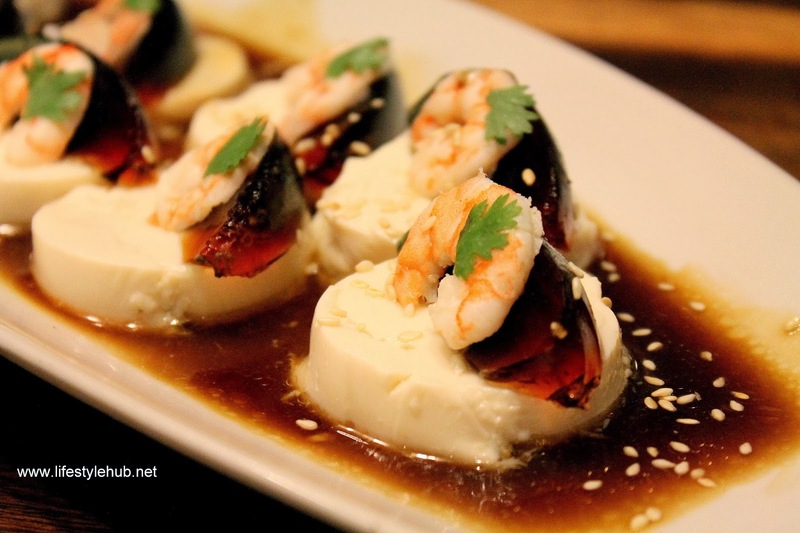 Here's a healthy fix for you from the only Mesa restaurant in the north: the Tofu Salad or the soft bean curd topped with century egg and shrimp. T'was a good day for Clark as music fans converge in the area for the Red Hot Chili Peppers-bannered music fest "We Are 7107". Me and other bloggers were also on our way to the same venue but not to sing "Zephyr Song" or jam to "Californication." That Sunday, we are up for a food trip. 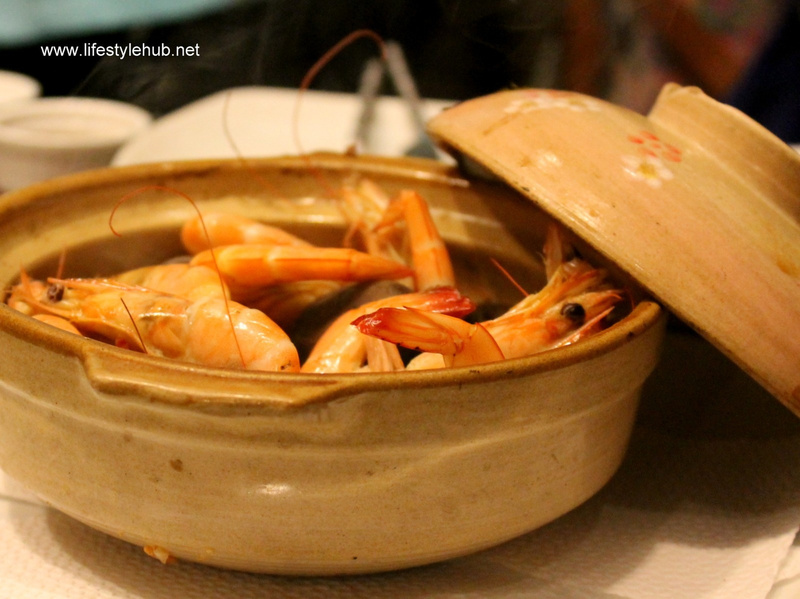 We're there to devour on the offerings of the only Mesa restaurant in the north, trying out not just Pampanga's kitchen wonders but also the regional dishes from all over the archipelago. 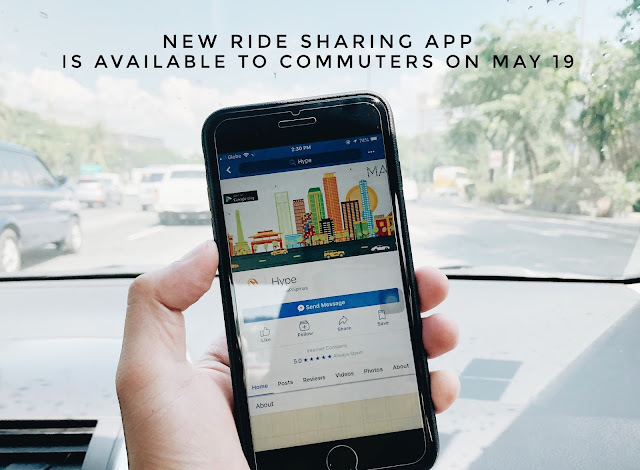 It was a smooth ride via NLEX but as what veteran food bloggers advise us, we starved ourselves to prep up for an upcoming feast. The crew of Mesa were ready though. Appetizers greeted us upon reaching the restaurant. Tawilis with Manga on Spoon (Crispy tawilis with silvers of ripe mango), Hito Flakes on Spoon and Baked Scallops with Garlic Butter (Scallops on half shell with garlic butter compound) provided the warm welcome. The tawilis, or the freshwater sardinella is one of the prime seafood ingredients by Filipinos. Mesa's take is to fry it and fry it good to make it crispy, extracting a more savory taste which will later on blend with the sweetness of the ripe mango. The baked scallops, on the other hand, provided a tasty surprise with the perfect amount of garlic butter added unto it. 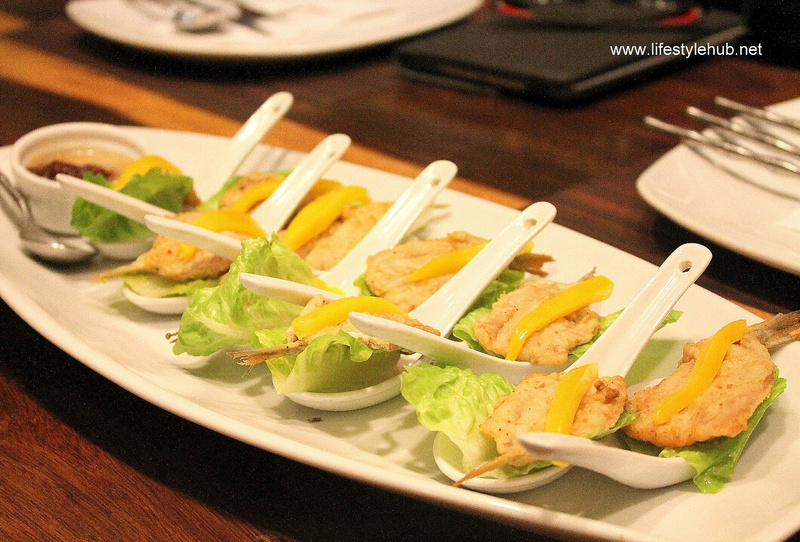 Not uptight with appetizers, here is the Crispy Tawilis with Silvers of Ripe Mango. 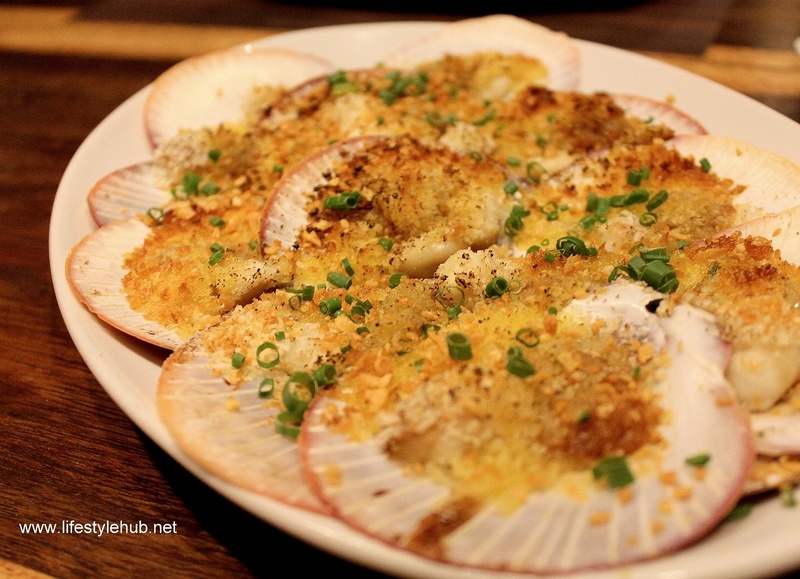 Below are Hito Flakes on Spoon and Baked Scallops on Half Shell with Garlic Butter Compound. I am a rice person and from being starved, my digestive track would not feel right without rice. Mesa is ready as usual, letting me choose from three rice recipes. We were served Tinapa Rice, Sisig Rice and the Black Basil Rice. 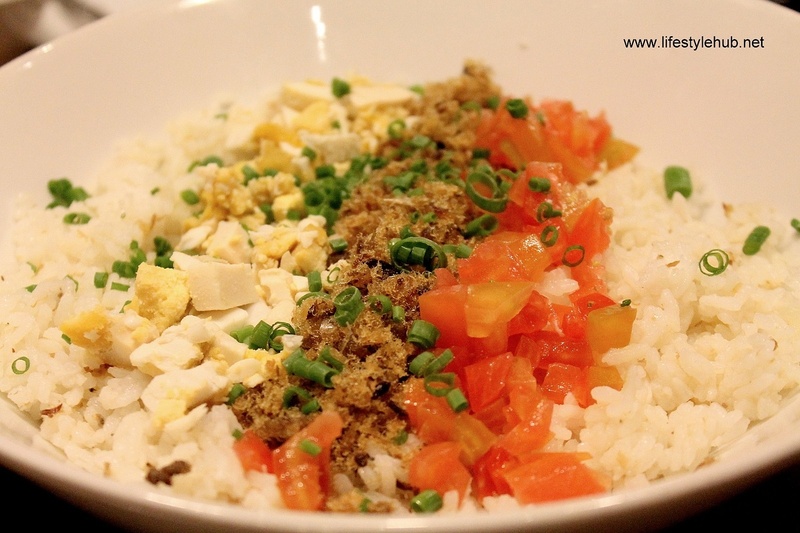 If you're a lover of Sisig Rice, you can expect more from Mesa's overly savoury version. One of the bestsellers together with the Tinapa Rice, their Sisig Rice boasts the distinct aroma we loved from our sisig with the pleasing aftertaste of spiciness. For those looking for a more pervasive savory smell, the Black Basil Rice is a must-try. Not that the its rice recipes need the main entrees, but Mesa was generous enough to serve us their signature and most requested dishes. The feast went on with the Chicken Binakol, Binagoongang Baboy ni Kaka and the Boneless Patatim. 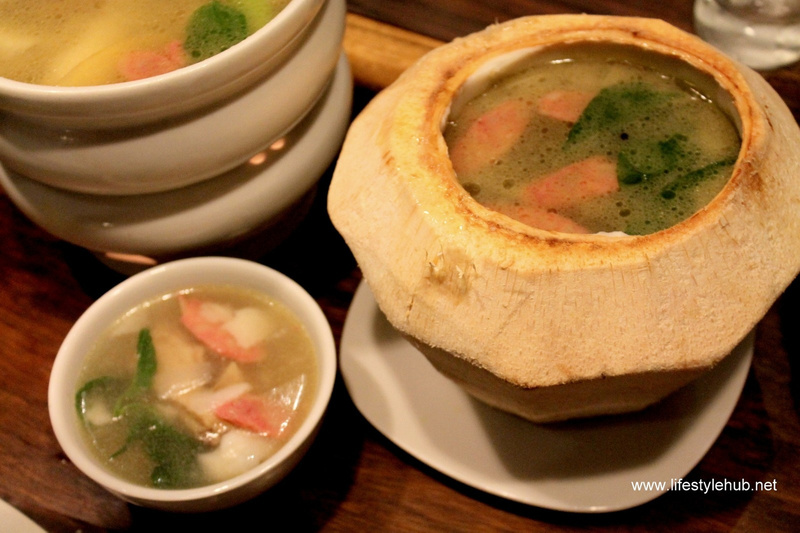 Instead of sayote, Mesa's version of the Chicken Binakol uses papaya with the soup made dense by the coconut sauce. The lover of Filipino cuisine will be delighted, on the other hand, with the Binagoongang Baboy ni Kaka which is made up of pan fried pork belly sauteed in shrimp paste with grilled eggplant. The Boneless Patatim, meanwhile, is the sweet and savory pork leg stewed in soy sauce and anise. How'd you like your Tinapa rice? Did you think our Sumptuous Sunday ended there? The highlight of the day is still about to be served. Lechon, anyone? But as what Mesa taught us earlier, we should expect more. Leaving the usual lechon, we were introduced to the Crispchon, or the roasted piglet served with pandan crepes, wansuy, cucumber and leeks garnishes. When you order this (PhP4,550- whole, PhP2,400- half, PhP1,400- quarter, PhP1,050- 1/6th), you have the chance to choose three from the six kinds of sauces available: Rikki's Choice, Garlic Mayo, Sweet Chili, Spicy Pork Liver, Wansuy Infused and Curry Mustard. My favorite is Rikki's Choice but I'm sure there is that perfect sauce for everyone. With more than 10 branches of Mesa scattered in the Metro, I'm sure you had a taste of their sumptuous Tinapa Roll Wrapped in Lettuce, Crispy Boneless Tilapia Served with Four Sauces, River Shrimp on the Rocks, Bistek Bangus Belly, Boneless Crispy Pata, Seafood Bean Curd Wansoy Soup, Salpicao Ostrich and/ or Laing Two Ways. 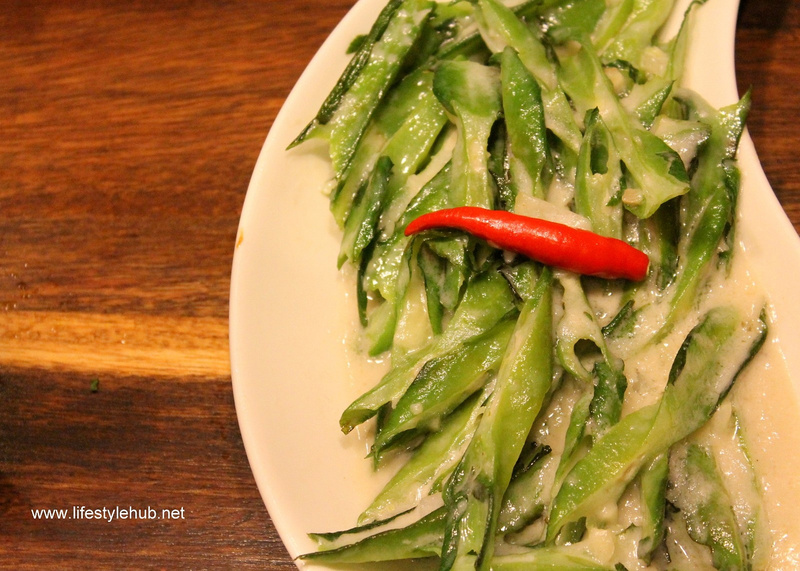 But if you're from the north or you're planning for an out-of-town picnic with the family, Mesa Filipino Moderne in SM City Clark is an excellent gastronomic stopover. 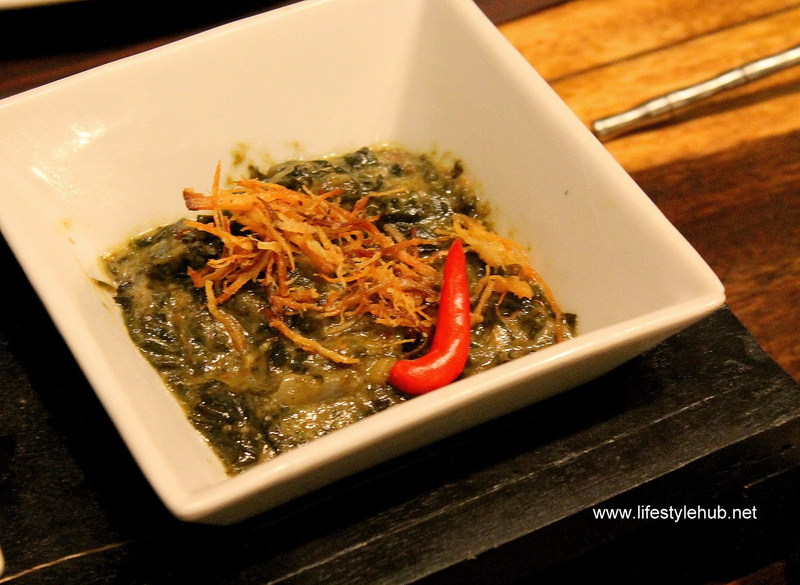 The other half of Laing Two Ways is the coconut cream topped with adobo flakes. Not in picture is the tasty mixture of taro leaves, pork and shrimp paste in another bowl. 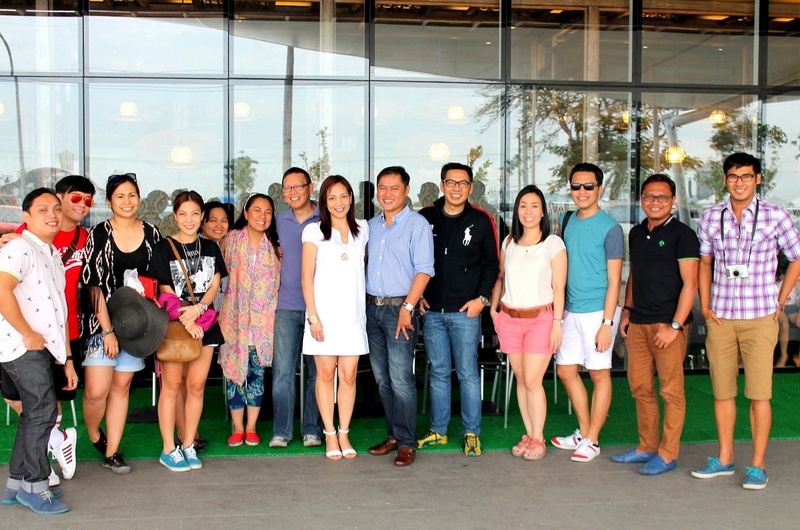 Business partners and Mesa- SM Clark owners Russ Recina (7th from right), Jojo Sicat (9th from right) and Oging Sicat (10th from right) teach bloggers that although Kapampangans are proud of their own culinary wonders, they are also capable of embracing different regional dishes coming from different parts of the country. Mesa Filipino Moderne helped in making that happen.